Who designed the Vermont flag and when was it adopted? What does the emblem on the Flag of Vermont represent? Where may I purchase a Vermont flag? How are you supposed to fly a Vermont flag with an American flag? The Vermont state flag has been changed on numerous occasions throughout history, but the current state flag was adopted on June 1, 1923. 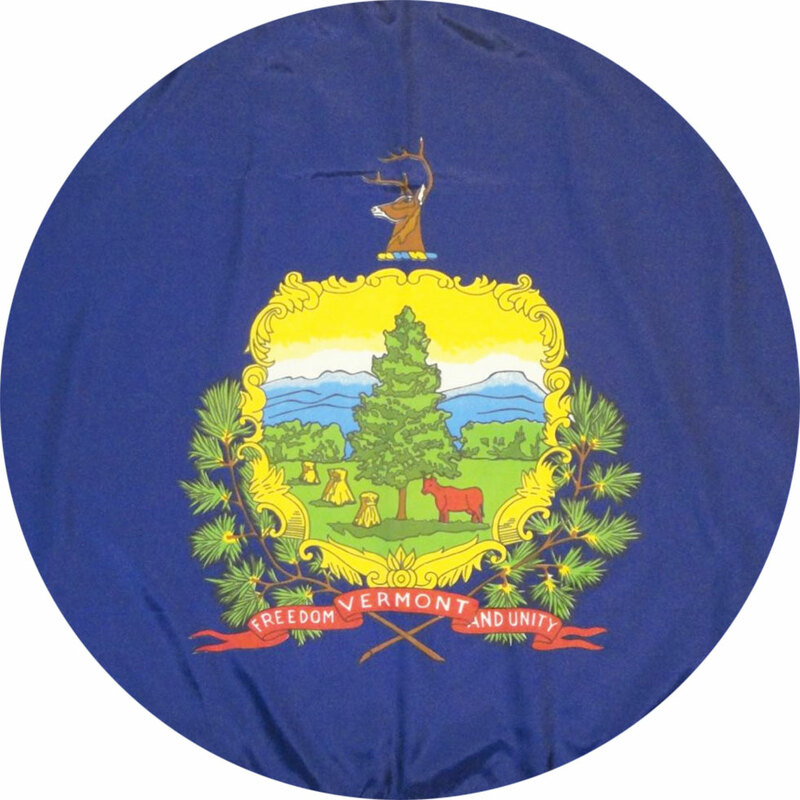 The designer of Vermont’s state flag is unknown. The central design on the flag is the Coat of Arms and motto of Vermont. Most of the elements found in the Coat of Arms come from the Great Seal of Vermont which was designed by Ira Allen. The emblem on the Flag of Vermont is the Coat of Arms and motto of Vermont. 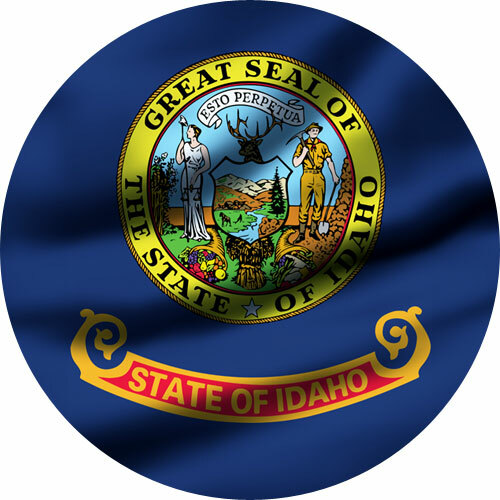 Above the shield is a stag’s head which symbolizes the wildlife of the state, as well as purity, fleetness, and peace unless provoked, and it’s antlers strength and fortitude. The two pine branches on either side of the shield offer support and represent the pine sprigs worn by the soldiers near the end of the War of 1812, during the Battle of Plattsburgh. The pine tree in the middle of the shield represents the verdant forests of Vermont, which provide natural resources to make various products. The three sheaves of wheat represent the vegetative aspects of agriculture and the cow symbolizes the breeding of cattle for dairy and meat products. The Green Mountains are in the background and represent Vermont’s beautiful landscape. Below the shield is a red scroll with the word, “Vermont” and Vermont’s motto, “Freedom and Unity”, which evens two different ideals, the freedom of the citizen and the welfare of the common good. In heraldry the color blue on a flag represents, vigilance, truth, loyalty, perseverance and justice and the color yellow or gold symbolizes the sun, generosity and wealth. 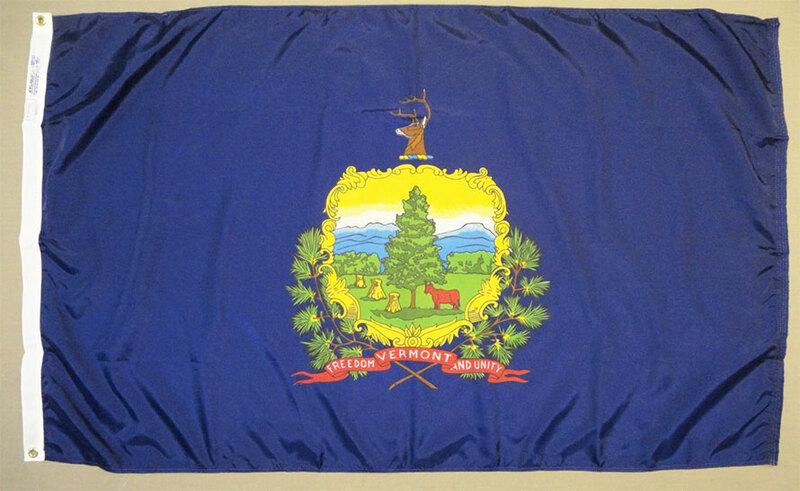 To buy a 100% made in the USA Vermont flag, then purchase one from Star Spangled Flags. 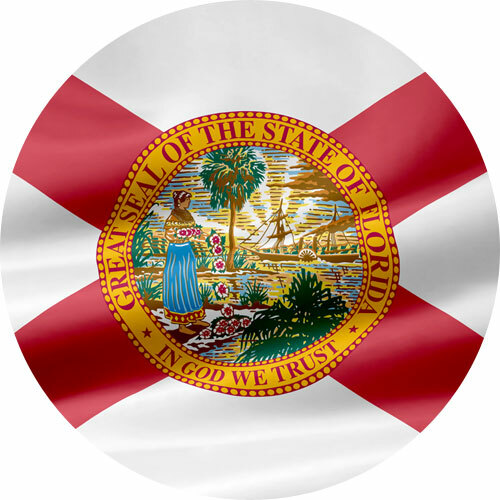 They treat their flags with a UV protectant to protect them from sun damage and use a very strong nylon fabric with strong lock stitching to keep them durable and prevent unraveling and fraying. They also have a 100% customer satisfaction guarantee and free shipping in the USA! When flying the Vermont state flag and American flag on the same pole, the flag of the United States must always be at the top and the Vermont flag should be the same size or smaller. When It is flown on separate poles, the Vermont flag will be to the right of the flag of the United States situating the U.S. flag in the position of honor, which is to the observer’s left of the other flags. The state of Vermont’s flag is quite unique which shows the states early beginnings and how they came to be the 14th state making up the union on March 4, 1791. 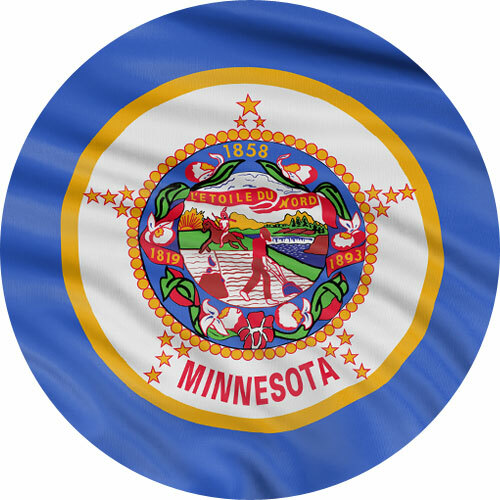 The flag shows the state’s coat of arms including the motto on a field of azure. Interestingly we can also see representations from the battle of Plattsburgh towards the end of the War of 1812 and the Vermont forests. Vermont is into dairy and agricultural industries shown also on the flag. 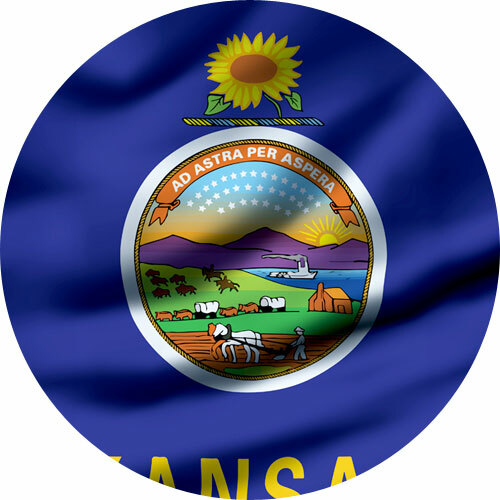 Their motto is “Freedom and Unity” which is also included on the state flag. Called the Green Mountain State owing to the French words “vert mont” that means “green mountain” and some interesting facts would be that the state flower is the Red Clover, Sugar Maple as state tree, Hermit Thrush is the state bird, Morgan Horse as the state animal, Honey Bee is the state insect, Apple Pie as state pie, Apple is the state fruit and the Brook Trout & Walleye Pike are the state fish. The famous ski resorts in Vermont are the Maple Syrup and Autumn Splendor. The state has 1 national forest and 52 state parks.